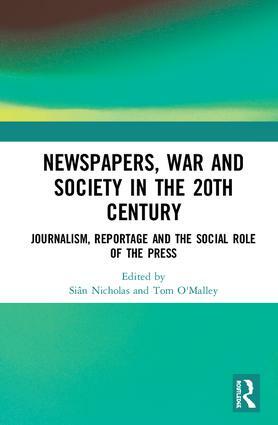 This book offers fresh research and insights into the complex relationship between the press, war, and society in the 20th century, by examining the role of the newspaper press in the period c.1900– 1960, with a particular focus on the Second World War. During the warfare of the 20th century, the mass media were used to sustain domestic morale and promote combatants’ views to an international audience. Topics covered in this book include British newspaper cartoonists’ coverage of the Russo- Japanese War, the role of the French press in Anglo- French diplomacy in the 1930s, Irish press coverage of Dunkirk and D- Day, government censorship of the press in wartime Portugal, the reporting of American troops in North Africa, and how the Greek press became the focus of British government propaganda in the 1940s. Particular attention is given to the role of the British press in the Second World War: its coverage of evacuation, popular politics, and D- Day; the war as seen through commercial press advertising; the wartime Daily Mirror; and Fleet Street’s role as a ‘national’ press in wartime. This book explores how— and why— newspapers have presented wars to their readers, and the importance of the press as an agent of social and political power in an age of conflict. This book was originally published as a special issue of Media History. 12. Was there a national press in the UK in the Second World War? Siân Nicholas is a Reader in Modern British History at Aberystwyth University, UK. She has published widely on the history of the mass media in war and in peace. Her books include The Echo of War: Home Front Propaganda and the Wartime BBC, 1939–45 (1996), and Reconstructing the Past: History in the Mass Media 1890–2005 (edited with Tom O’Malley and Kevin Williams, 2008). Tom O’Malley is Emeritus Professor of Media at Aberystwyth University, UK. He is co-editor and co-founder of the journal Media History and has published widely on press and broadcasting history and policy. His books include Closedown? : The BBC and Government Broadcasting Policy, 1979–92 (1994), Regulating The Press (with Clive Soley, 2000), and The Media in Wales: Voices of a Small Nation (with David Barlow and Phillip Mitchell, 2005).